The Titan 12T 550 modified motor is designed for incredible mod-motor power output with virtually maintenance-free operation and long-lasting performance. 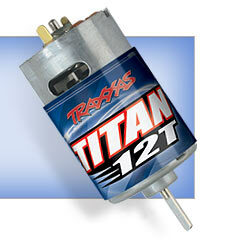 The Titan 12T 550 motor's integrated cooling fan pulls cool air through the motor to keep temperatures down. Airflow is routed through vent tunnels molded in the motor plate. A cooler running motor equates to faster speeds, longer runtime, and extended motor life. The XL-5 Electronic Speed Control offers high current handling, EZ-Set® one-button setup, and smooth high-frequency control. Three drive profiles, low voltage detection, thermal shutdown protection, gold-plated connectors, and incredibly low resistance are all features you might expect to only be available on an expensive replacement ESC. As today's batteries store more and more energy inside their cells, traditional battery connectors could no longer keep up. 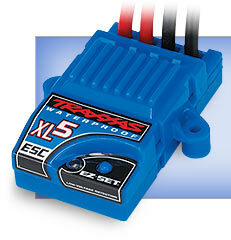 The included patented Traxxas High-Current Connector opens the door for unrestricted current flow. 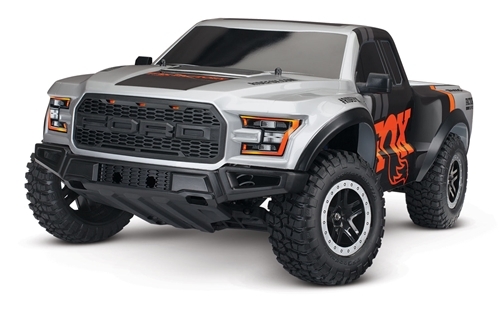 The full-size Ford Raptor is built for extreme horsepower—so is the Traxxas model! Velineon™ brushless horsepower (sold separately) simply bolts in to boost speed to 40+mph. 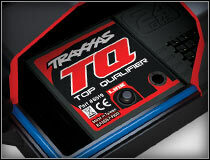 Add 11.1V Traxxas Power Cell LiPo batteries and you have the potential to double your speed--over 60mph! Bigger roosts and longer hang-times are right at your fingertips. The included steel transmission gears, full ball bearings, and high-quality metal turnbuckle links are the winning setup for brushless durability. The factory-installed planetary differential is Traxxas-tough with hardened steel gears that never need adjusting! Perfect for long-lasting, all-day fun. Accessory battery hold downs are available for use with large capacity LiPo battery packs that can extend speed and run time. Compare the durability and features to others and you'll see that only Traxxas makes them truly brushless ready. Designed and engineered by Traxxas, the XL-5 Electronic Speed Control handles the elements while smoothly supplying power to the motor. This high-performance ESC is packed with impressive specifications that are normally only found on more expensive high-end replacement units. The XL-5 features a completely waterproof design, low voltage detection, three throttle profiles, Thermal Shutdown Protection, 4-7 cell compatibility, and built-in BEC. High frequency operation combined with ultra-low resistance make the XL-5 an efficient and ultra-smooth fully proportional speed control. An exclusive feature on the XL-5 is the patented Training Mode™. This profile reduces the overall power output of the XL-5 by 50% making it easier for young or new drivers to develop their control skills before unleashing full-power operation. 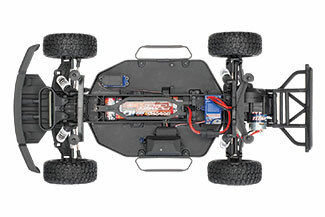 The XL-5 is manufactured by Traxxas to ensure the highest level of quality and support. The powerful Titan 12T 550 modified motor features an over-sized armature (30% larger compared to 540-sized armatures) with 12-turns of pure copper wire for big torque and increased power-handling capabilities. Lower running temperatures are achieved with an integrated cooling fan. 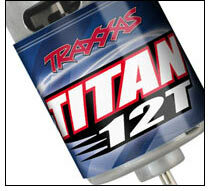 The Titan 12T requires very little maintenance and is designed for consistent torque and high speeds from run to run, without fading. 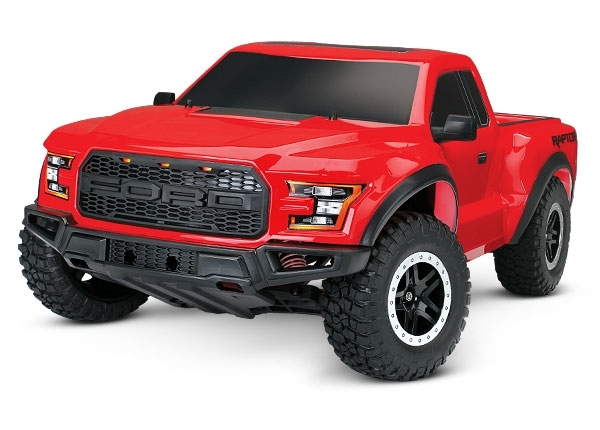 The Traxxas Ford F-150 Raptor replica includes a genuine iD-equipped Power Cell NiMH battery to make sure you experience all the performance that’s been engineered into your Traxxas model. Accessory Traxxas iD chargers (sold separately) auto-detect Traxxas iD Power Cell batteries and automatically set and optimize charge settings for unmatched charging safety and simplicity. Traxxas iD Power Cell packs are optimized for free-flowing power and maximum punch with premium quality, low-resistance cells; flexible, silicone-jacketed 12-gauge wire; heavy-duty welded tabs; and Traxxas’ high-output, gold plated, patented, High-Current Connectors. Precision assembly with attractive, individually wrapped cells and clear overwrap complete the Traxxas Power Cell package. For even greater speed and runtime, a full line of optional Traxxas iD Power Cell NiMH and LiPo batteries are available. Power Cell batteries are Traxxas certified to maximize the performance and speed engineered into every Traxxas vehicle. 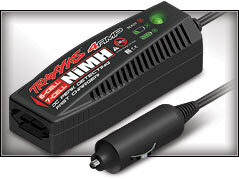 Learn more about Traxxas Power Cell NiMH and new LiPo Batteries here. Designed to handle high-current applications and funnel maximum power to the electronics, the electronic speed control and battery are equipped with Traxxas High-Current Connectors. Engineered with iD technology, the included 3000mAh NiMH battery is optimized when charged with a Traxxas iD charger (sold separately). 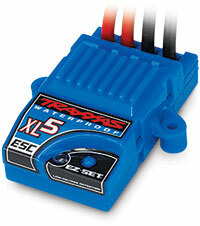 Traxxas iD chargers automatically configure and optimize the charger settings for a perfect charge every time. Traxxas iD chargers provide the quickest, safest charge for your battery so you can unleash the maximum power and runtime for your Traxxas vehicle. A high-performance truck needs a powerful steering servo for responsive performance. 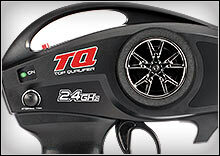 The waterproof steering servo (#2075) uses O-ring seals to keep the fun going when things get wet. The Traxxas digital high-torque servo provides precise steering authority and speed for wheel-to-wheel racing in the back yard or on the track. The patented sealed receiver box is another Traxxas innovation that puts the Ford Raptor and all the Slash models in a league of their own. The antenna and servo wires route neatly through a special water-tight seal. A custom blue O-ring seals the receiver box to protect the receiver from water. The receiver can be removed for service and aftermarket receivers can be installed without losing the sealing properties of the box. An aluminum antenna crimp nut looks good and holds the antenna tube securely in place. The Ford Raptor's chassis is shared with the award-winning Slash and features a 13.2" wheelbase, over 3.5-inches of ground clearance, and is molded in black for a tough new look. The chassis includes drain holes and a battery tray channel for routing servo wires to the receiver. Optional electronic speed control mounting bosses are incorporated into the chassis, making it easy to upgrade to the Extreme Power of the Velineon Brushless Power System. For race track competition, a transponder mount is located under the front shock tower when every second counts. Integrated chassis nerf bars offer side body support for door to door racing action and impact protection. Ruggedly designed body mounts incorporate reinforced washers to support the short course truck body during big-air jumps and high-speed runs. Engineered to handle the abuse of bumper to bumper bashing, the integrated front bumper is designed to absorb brutal impacts while looking the part of an aggressive off-road-ready truck. Realistic looks, realistic performance. The rugged tires have excellent grip in the dirt, just the right amount of slide on pavement, and are mounted and pre-glued on impressive 2.2" wheels with distinctive satin "beadlock" rings and black split-spoke centers. Factory fitted, heavy-duty steel turnbuckles allow camber and toe tuning. The suspension is completely adjustable right out of the box to fine tune handling agility and high-speed performance. Captured rod ends provide unmatched durability and they simply won't pop off. The composite Traxxas planetary gear differential now features a steel ring gear with a nylon housing for long life. It uses hardened steel internal gears for maximum strength during rigorous off-road bashing. This type of differential requires virtually no maintenance and its efficient design puts maximum tire-shredding torque to the wheels. The Ford Raptor features heavy-duty drive yokes which are designed to provide maximum durability to withstand extreme power. The slider driveshafts are extremely durable, and they allow greater articulation for increased suspension travel. The Ford Raptor reaches its blistering 30+mph top speed on-road using the optional 23-tooth pinion gear (included) and a 7-cell 8.4V battery pack. Out of the box, the installed 16-tooth pinion gear is just right for all-around, on- or off-road action. The Ford F-150 Raptor replica features heavy-duty ball bearing front steering blocks and rear hub carriers. They utilize large 5x11mm ball bearings for long-term precision performance, smooth operation, and increased durability. Proven performers, the Raptor's oil-filled Ultra Shocks utilize X-ring technology for a perfect seal and super-smooth performance. They are fully tunable with a wide range of oils, springs, and pistons. Features include pressure bladders for air/oil separation and spring clips to precisely change the ride height and spring pre-load. They can be renewed in minutes with our inexpensive rebuild kits. The race-tuned progressive rate springs soak up the small bumps as a softer spring would, but when the conditions get rough and the jumps get big, the progressive rate springs step up to the challenge by getting firmer as the suspension is compressed. The long-lasting, white powder coated finish accent the Raptor's rugged off-road styling. No need for a paint or sticker session; the Ford F-150 Raptor rolls out of the box ready for action with a factory-finished with decals already applied for you, so it's Ready-to-Race®.